From the sprawling sand dunes of Ica, to the traditional stone streets of Ollantaytambo, and from the ancient fortress of Cusco, to the jaw-dropping ruins of Machu Picchu, Peru is a country of incredible contrasts. The country with the "WOW" factor, and a destination on everyone's must-visit bucket list. 12 days of unforgettable exploring gravity-defying ancient estates, adrenaline-rushing activities, and unique wildlife in every direction. 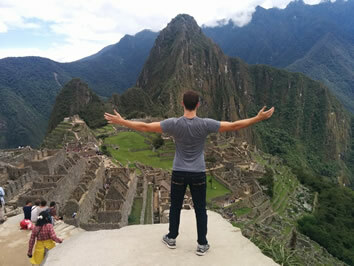 Our 12-day gay trip through Peru mixes our laid-back travel concept with Peru's most unique and memorable sites to form an adventure that you'll be talking about forever. 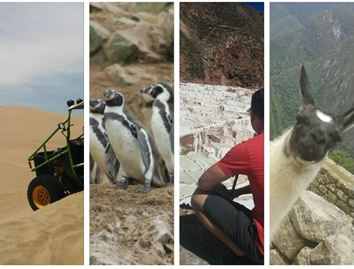 Whether you've always dreamed of soaking up the incredible mountaintop Inca ruins of Machu Picchu, taking a scenic train journey through the Peruvian Andes, or you're ready to discover off-the-beaten-track sites like the desert oasis of Huacachina and the penguin-filled (yes – penguins!) Ballestas Islands, Peru is ready to blow your mind! With breathtaking vistas in every direction, incredibly unique local culture, and an unlimited number of exciting activities along the way, Peru is a perfectly enriching destination. Our 12-day Peru trips include many of the "big ticket" items of your experience, including your roundtrip domestic flights, train passes, Machu Picchu entrance passes, and more! Check out our detailed list of inclusions and exclusions below. ** - Trip prices based on twin share. Traveling solo? We'll match you up with another traveler at no extra charge, or just pay a $690 single supplement for your own room! Our 12-day Peru trip mixes the jaw-dropping Andean mountain range, with the unique highlights of the Pacific Coast, while starting and finishing in the bustling capital city of Lima. From the sand dunes at sea level to the historic mountaintop fortresses, these 12 days in Peru encompass the diversity that makes Peru famous. Below is a brief itinerary of our stops, but for detailed info and available activities check out the links to the left. Most travelers will arrive into Peru's largest airport in Lima on day 1 and meet at our starting and ending point in the community of Miraflores. Our time here in Lima is spent exploring the highlights of the city including the rich history, the famous culinary scene, and the naturally beautiful coastline. Lima may not be on the list of the world's most wild gay communities, but there is plenty of nightlife and a very welcoming community in Miraflores. 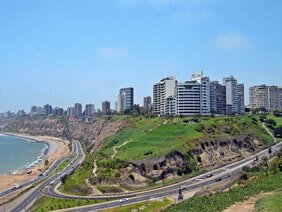 Lima is the capital and largest city in Peru. Located directly on the Pacific coast, our favorite neighborhood and base while in Lima is the trendy community of Miraflores. In recent years the local cuisine has been a major focus of international attention with local exotic flavors mixed up in dishes that are sure to keep any foodie's palate jumping for joy. Step outside into the streets and you'll find centuries old history in world-class museums and intricate cathedrals meshing with a modern twist of highrises, and beach-front shopping leading down to a long coastline dotted with surfers catching a wave. Lima's gay scene is alive in Miraflores with several gay nightlife venues catering to several different tastes. A high percentage of LGBT people in the Miraflores area and a visible anti-discrimination promise posted in a large number of business creates a very welcoming mood for gay locals and visitors. On our second day we jet off into the Andes Mountains on a 90-minute flight to Cusco, then down the road into the Sacred Valley to spend two nights in a town which was a former royal estate of an Inca emperor. Surrounded by history and natural beauty, our two nights here are an opportunity to immerse ourselves in the ancient times of the Incas who ruled over this area hundreds of years ago. The beauty of the area and the surrounding Inca ruins ensure this is an unforgettable stop in Peru. Most people have never heard of the small town of Ollantaytambo prior to their Peru visit, but this former royal estate of an Inca emperor, tucked into a valley in the Andes, is sure to be a unforgettable stop. Typical Inca architechture is still in use aroud town, and incredible ruins dot the cliffs that overlook the valley below. The picturesque Urubamba river runs through the town on its way down the mountains and offers a beautiful riverside hiking path with fantastic views. 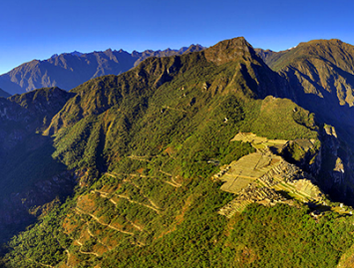 Ollantaytamo is part of the Sacred Valley, the heavily defended passageway to Machu Picchu in the time of the Incas. The grand terraces, large storehouses, and "Temple Hill" are still visible today and ready to be explored. Hiking and exploring dominate our two nights in this historic Inca town, although options of museums, ziplining, rock-climbing, and cooking courses are also available. Our fourth day is a day that's surely been in your mind for many years. We depart Ollantaytambo in the morning on a 2 hour train journey through the Andes, winding along the Urubamba River. Before long we arrive in the mountain town of Aguas Calientes, names after the hot spring flowing nearby. From Aguas Calientes it's only another 20 minutes by bus to the unforgettable mountaintop ruins of Machu Picchu. Our first two hours here is spent exploring the ruins with our favorite local Peruvian guide, who was born and raised in the area and an expert on everything Machu Picchu. The rest of our day is spent soaking up the incredible site which was lost to the outside world for many centuries. Instead of rushing off the mountain to catch the train back out of town, we stay the night at the base of the mountain in Aguas Calientes, giving us what seems like Machu Picchu all to ourselves. 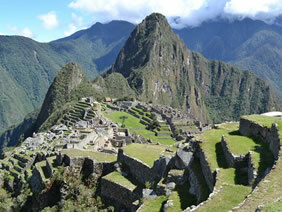 Machu Picchu is one of those sites we've all heard about since our childhood. The ancient Inca ruins that rise out of the rural Peruvian Andes, strategically placed on the top of a majestic mountain, and remarkably undamaged by the many hundreds of years it sat lost and deserted. There are many unproven theories as to what this site was, and why it was so important, but those are just a couple of the many mysteries that surround this famous landmark. Our trip to the Machu Picchu area is by a comfortable 2 hour train ride, along the Urubamba river, meandering through valleys until we reach our base, the town of Aguas Calientes. With no roads connecting Aguas Calientes to the rest of the world, this rural town maintains a peaceful "off the beaten track" feeling. 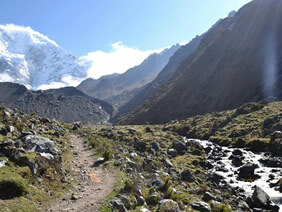 This is our base for experiencing both the quaint town as well as the incomparable Machu Picchu of course! The daytime here is dedicated to exploring the famous mountaintop site with the help of our favorite local guide, who is as fun as she is informative. Spend the day exploring the site itself or combine it with the optional hike up Huayna Picchu to get a birds eye view of the whole complex! There's a reason why a visit to Machu Picchu is on everyone's must-see bucket list. Spending a night in Aguas Calientes gives us the opportunity to experience Machu Picchu at our own pace, without the rush of catching the last train back out of town in the afternoon like so many others! On day 5 we leave time for catching the sunrise at Machu Picchu or braving the hike up Wayna Picchu before jumping on the scenic afternoon train and heading back to Cusco. 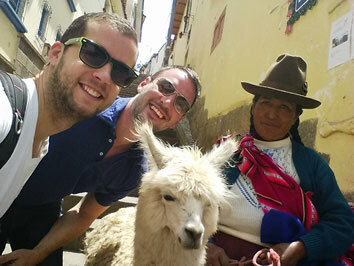 Our three-night stay in Cusco gives us time to visit many of the area's ancient sites, taste the unique local food, take part in a hike, and even experience some gay nightlife way up in the Andes. It's true, the city of Cusco is perched high up in the Andean mountain range at an altitude of approximately 11,000ft (3,000m) above sea level. The air up here is clean and surprisingly warm (during the daytime) and the city is a contrast of ancient stone streets and cathedrals scattered among a modern commercial center. 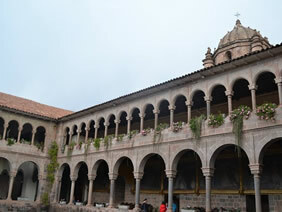 Cusco is a destination in itself as well as a jumping off point to the Sacred Valley to the west, the Amazon to the north, and the higher peaks of the Andes and Lake Titicaca to the east. Although we fly into Cusco from Lima, our three nights here come after our visit to the lower altitudes of the Sacred Valley and Machu Picchu in order to avoid the effects of Cusco's altitude, so there's absolutely no need to worry about the altitude here! 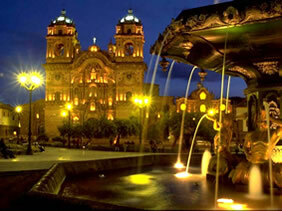 Cusco has an incredible variety of options to keep any traveler entertained. 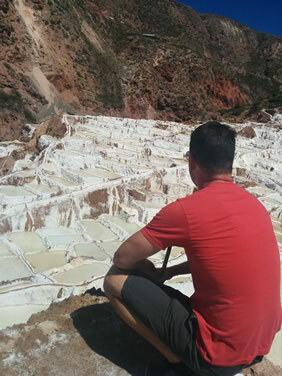 Hike to the ruins of Sacsaywaman, taste the salt from Moray's unique cliff-side salt flats, rock-climb to a zipline off the Urubamba cliffs, or watch the diverse world go by while sipping coco tea perched above an ancient square. Day 8 is our only "long" travel day of the trip, starting in the morning with a 90-minute flight off the mountain, a quick transfer in Lima, and a 3 hour ride down the Pan-American Highway to the pelican-filled seaside town of Paracas. With golden sand dunes as far as the eye can see, islands full of penguins, a palm-treed oasis in the desert, wineries and bodegas galore, and the famous Nazca lines nearby, this is a completely different side of Peru that can't be missed! The coastal town of Paracas is absolutely jam packed with beauty and adventure and a must-visit on your trip to Peru. Vineyards for the wine-o's, endless sand dunes for the adventurers, marine parks for the nature enthusiasts, cycling routes for the wanderers, and a peaceful beachfront base to return to after taking it all in. The Paracas area is short distance from Lima, but a world away from the Peru that we experience in the other half of this trip. This area proves that Peru is a country of incredible contrasts, all with their own unique beauty. 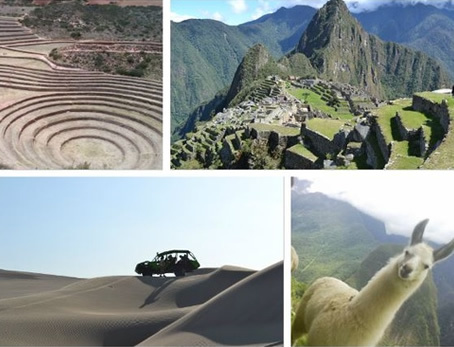 The opportunites to experience Peru's uniqueness here are numerous. Take a short trip out to the town of Pisco, famous for being the traditional source of Pisco brandy, and ready to let you sample any type you'd like. Venture out to Huacachina, a picture-perfect oasis in the middle of seemingly endless golden sand dunes. Jump on a sandboard or into a dune buggy and hit the sand around the town of Ica. Go onboard a morning Ballestas island boat trip to see sealions, countless species of birds, and even Humboldt penguins! Pedal around the coastal nature reserve by bicycle on a scenic bike route surrounded by wildlife. When your day's adventure is done your home base here is directly on the Pacific Ocean with an view, a breeze, and maybe even a pelican visitor. On the afternoon of our 11th day we travel back up the Pan-American highway to Lima where we've got one last evening together as a group in our base of Miraflores. This is our time to have one last feast together and grab some last-minute souvenirs before we all say "adios" and "hasta luego" to each other and Peru! On this 8-day trip we'll be spending the majority of our time high up in the Andes mountain range. While the daytime is completely warm enough for shorts and a t-shirt, the evenings cool down to sweater-weather. Temperatures don't change much in Peru where instead of a 4-season climate, they only experience a dry season (April to November) and a wet season (December to March). It's a good idea to bring a couple items of warm clothing for those brisk mountain evenings, although the majority of your time will be nice and warm! Rain is not common in the season we operate in, but light rain gear is a good idea as a precaution. Enjoy Peruvian food? It's even better in Peru! The cuisine here has recently been receiving worldwide attention for its incredible flavor and diversity. Beef, chicken, beans, chicharron, and flavorful mixed rice dishes can be found on almost every menu. Detours doesn't believe in limiting your choices by including all of your meals at pre-decided restaurants as part of the trip package. Instead, we include all of your breakfasts to start your day off, then encourage you to explore all of the different restaurant options available to you for lunch and dinner. This way you can eat when you want, where you want, with whomever you want, and spend what you want! Your trip leader definitely has their favorite spots so if you'd like some advice on the best in each location, just check with them. Our advice is simple. Pack your bag, then take half of those things out and leave them back home. It's common to hear people wishing they'd packed less stuff, but we've never heard anyone complain that they didn't bring enough. Even if you realize you forget to pack some crucial item you can always pick up a replacement once you arrive in Lima. More information including a suggested packing list is included in your Pre-trip guidebook on your "Your Trip" page, available after your trip registration. We REALLY suggest just bringing your regular bank card from home and using the local ATMs to get cash; in our experience it's much cheaper than any currency exchange service in Peru or even at home. Peru uses Nuevo Soles as their local currency, although US Dollars and credit cards are also commonly accepted at most restaurants. Tipping isn't a native Peruvian custom, however, it is always appreciated by local service staff. We suggest tipping for any services that go above and beyond expectations. That extra dollar or two on a dinner bill is very appreciated by the service staff. Our local guides during the trip are the exception to this, as their position has come to expect tips for a job well done. We have pretty high standards when it comes to choosing our accommodations, and trust us, we've done plenty of room-sniffing, pillow-patting, and bathroom inspections to make sure we stay at quality spots. To be approved as a Detours accommodations provider, a guesthouse must: be locally owned (to support the local community), be in an amazing location (close to the hot spots), AND be gay-owned or gay-friendly. We won't be staying in 5-star Ritz-Carltons but we also won't subject you to anything we wouldn't want to stay in ourselves. Clean and comfortable 3-4 stars, you can count on that! All of our trip leaders are gay, and all certified leaders must undergo a rigorous training routine that includes deep-fried cricket eating, and impromptu dancing tests. Apart from these vital skills, we require our leaders to know their stuff really, really well. Underneath their fun and quirky facades, our trip leaders are experts and passionate about what they do. Don't hesitate to ask them to teach you some Spanish or question them about a random statue you might see along the way. Their job is to help ensure that this is your trip of a lifetime by taking the hassle out of your trip and enabling you to experience everything you came to Peru for. We do absolutely everything possible to avoid needing such a mundane awakening. A world without alarm clocks is one we want to be part of, and your "rise and shine" while in Peru should come from the sound of crashing waves or church bells in the distance. However, sometimes we are required to make early departures, but we do everything we can to minimize this. 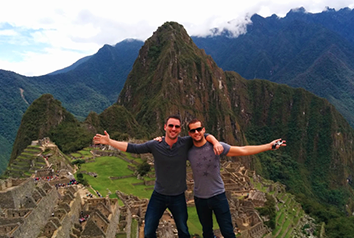 Extending Your Trip For many people, 8 days in Peru just isn't enough time. If you're lucky enough to be able to stay longer, or if you decide to quit your job and become a beach bum in the South America for the rest of your life, we'd be happy to help you extend (or cancel!) your return flight. We've been all over the area, so don't think twice about asking where to go or what to do after your Detours trip is complete. Brazil, Colombia, Bolivia, more of Peru... many interesting destinations are close-by. Our Detours groups are run with a minimum of 4 travelers and up to a maximum of 15 travelers. Ages of group members vary but the majority of our travelers are in their 30's and 40's. Whatever the age of the guys on our trips everyone's already got something in common, an exciting new experience in a new country! Each group is led by a Detours trip leader who is there to ensure everything goes off without a hitch, allowing you to focus on having the time of your life! The areas of Peru that we'll be visiting are quite open-minded and most people will be welcoming of homosexuality. That said, Peruvian culture is largely influenced by the Catholic church, and public displays of affection are generally frowned upon. In respect for their local culture we usually suggest keeping your excitement and affection for your partner to more private locations. Relax – we won't keep you from updating your Facebook status the whole trip. There are internet cafes and WiFi all over the place. If you're more the "E.T." type and would just rather call home, feel free to pick up a calling card at a corner store and make use of the many local payphones. Alternatively, if your mobile phone is "unlocked" you can pick up a local Peruvian SIM card which is quite affordable. Further information can be found in your "Trip Preparations" guidebook which is available to you after your trip signup. 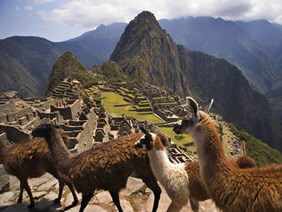 However, if you have any further questions about your Peruvian experience please visit our FAQ page or contact us. Price does not include 3% payment card charges.